Well, it really did happen. The radio broadcast, that is, not the alien invasion. 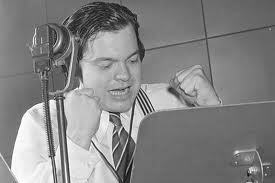 It was a radio play performed by the Mercury Theatre Players, produced and narrated by Orson Welles, based on the science-fiction tale War of the Worlds by H.G. Wells. Talk of your practical jokes, this was the ultimate. The radio play was so believable many listeners actually thought Martians were invading earth. Only at the very end of the broadcast did Wells break character and advise listeners that their performance had been a Halloween concoction the equivalent of, as he put it, "dressing up in a sheet, jumping out of a bush and saying boo." Sure, and he had half the northeastern United States and parts of Canada in an uproar. Some people fled their homes in panic. When I think of Fact or Fiction this is what I think of because listeners at the time really had no idea. The latest movie treatment of War of the Worlds - the one with Tom Cruise - was pretty good, despite Tom Cruise. But as the following trailer from the first version in 1953 indicates it was - in a tribute to Nicky and Mike - pretty cheesy. Warp on over to We Work for Wells and see how the rest of our alien friends handled the prompt today. I don't think there's any cause for panic. Pretty funny when we read about this now but it certainly wasn't very funny back then. Pretty scary, actually. That was scary then, but imagine how something like would be received today considering it could spread around the world in a matter of minutes. Even scarier. Oh yeah, with today's technology the sare factor would be awesome. I had the soundtrack of this on vying when I was a kid. It was awesome. Best. Practical. Joke. Ever. People actually committed suicide over that one. Doesn't get any better than that. Really, I don't think I knew that. I loved listening to this years after the fact. Orson Welles voice alone was something to be in awe of. This was years before Citizen Kane. One talented dude. I can see where people panicked. Just think if some "news break" told us today there was an invasion. ...would it be any different??? The hint that it might of been a hoax was the fact it was on Halloween night. Oh yeah, with today's technology the scare factor would be amazing. I had the soundtrack of this on vinyl when I was a kid. It was awesome. I don't know that there's been a hoax quite like this since. I've always thought that this was pure brilliance...I can see you thinking of something like this! No! The original movie is a classic! But yeah, Tom's was good too, and closer to the source material. Oh I simply loved this. If only I were alive when Welles pulled this off. The original movie is classic, indeed. Seen today, though, using special effects from the 50s the movie is somewhat laughable. I mean it was made 60 years ago. If Orson Welles pulled that prank today, he would be fighting lawsuits the rest of his life. He might even be sitting in jail next to Jodi Arias. Now, she is good at making up fiction! A few years back, there was actually a "reality" show that tried something similar. They got some people out in the desert at night and then staged an alien invasion. I don't think it ever aired because one of the people they pranked ended up having a heart attack. The aliens invaded New Jersey, btw. I miss New Jersey. The original "War of the Worlds" was so much better than the Tom Cruise version if you ask me. No comparison...just like the remake of "The Day the Earth Stood Still" - no comparison. None. None None None. I enjoyed the Cruise War of the Worlds alot. Actually very creepy. The original of course is a classic and great, especially when put into context with the era. This is an amazing take on Fact or Fiction. How did you even think of this.... you totally rocked it! I had to Google Arias. Having done that I think they might be able to give each other tips. But I think Welles was far more entertaining. Interesting how it's remained popular to this day, eh Babs? I completely missed that. I wonder if the producers were found criminally negligible for the guy's heart attack. Yikes. Yeah, and what about Invasion of the Body Snatchers. I loved the original. I was too young when it came out in 1956 but I remember watching it on late night TV when I was a kid. It just popped into my head. Thanks, Katherine. Glad you enjoyed it. 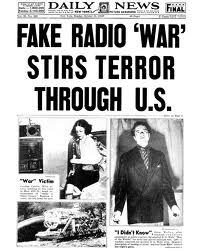 I remember listening to a recording of the original "War of the Worlds" radio play in its entirety. The first half was in the style of a live news broadcast, but the second half was narration from somebody who witnessed the aftermath of the attacks. The second half was narrated in the past tense, and was very clearly radio theater. All people had to do was stay tuned a little longer, and they would have realized it was all a show. It may have been clearly radio theatre to you but it sure wasn't to thousands of listeners. I laugh at them with the smug confidence that comes with historical hindsight! Yeah, as always, hindsight is a wonderful thing. While I wasn't alive when this happened, my grandfather Poppa Sye told me all about this story. And you're right, "Talk of your practical jokes, this was the ultimate." - INDEED! Oh, indeed. I listened to it years later, many years later, and was mesmerized. Google? Hell, P.J., they didn't even have TV.